Now that the busy holiday season is over, and Punahou Carnival has come and gone, it is time to focus on spring and summer display plans. This spring and summer are going to be very exciting! Fellow artist and good friend Dawn Yoshimura created a thought-provoking exhibit concept for Association of Hawaii Artists (AHA), and also a second excellent concept for Hawaii Watercolor Society. 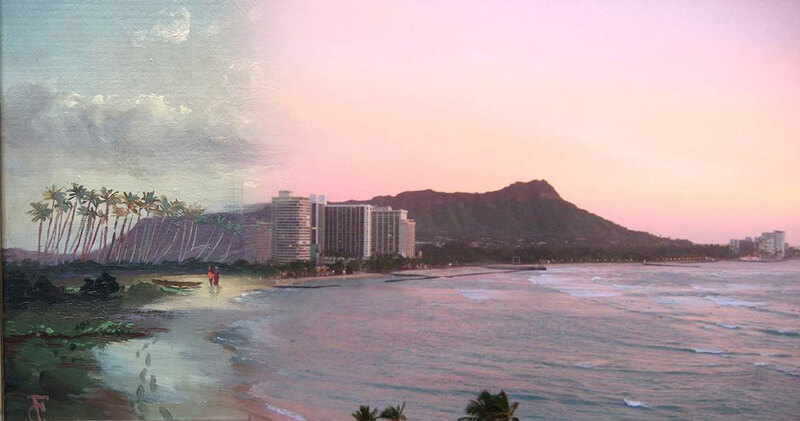 Amazingly, both ideas were accepted by Honolulu Art Museum, and thus, HWS will be busy working on their exhibit, while a group of us from AHA are working on our exhibit, simultaneously bringing these two beautiful ideas to fruition. Having both proposals accepted is quite a honor and an accomplishment for Dawn. Now she is putting her energy into making the AHA exhibit a reality. I am involved with the AHA exhibit, a prestigious curated show for AHA which will give local artists a chance to show their love of the beautiful islands we live on. Working with Dawn, and AHA’s new president, Kimberly Howsley, we drafted the initial prospectus and associated plans for the upcoming event and exhibit for AHA. The title is: Wahi Pana: A Sense of Place. “Wahi pana” is a special term in Hawaiian. It roughly translates to “the pulse of a place”. It’s quite an amazing imagery. Perhaps the most intimate marking of time we each experience is the pulse of our own hearts. To extend that intimate, universal sense of time to a specific special location is to extend the bounds of our bodies and our senses into the natural world surrounding us. 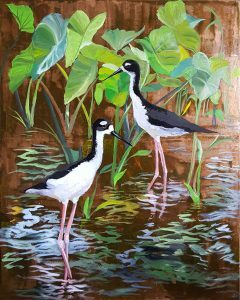 To me, it shows the beautiful reverence for nature that is present in the names and sayings of the Hawaiian culture and language. The important things that happen over the course of time add to the mana or energy of the place. To know the story of a location is to develop a deeper understanding of the feeling you might get when you step into a certain part of the island. 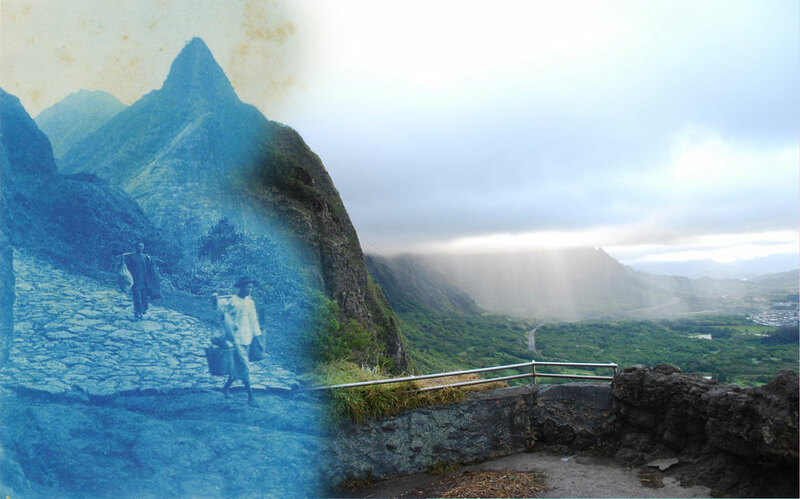 Pali Outlook 1800s to Modern Day: Pali Highway is one of the arteries for modern traffic moving to and from Honolulu and the windward side. It was once a path for Hawaiian villagers and later farmers to bring food by foot and later by cart from farms on the rural windward side over to Honolulu. Vintage photo courtesy of Kailua Historical Society, modern photo and composite by Wendy Roberts. 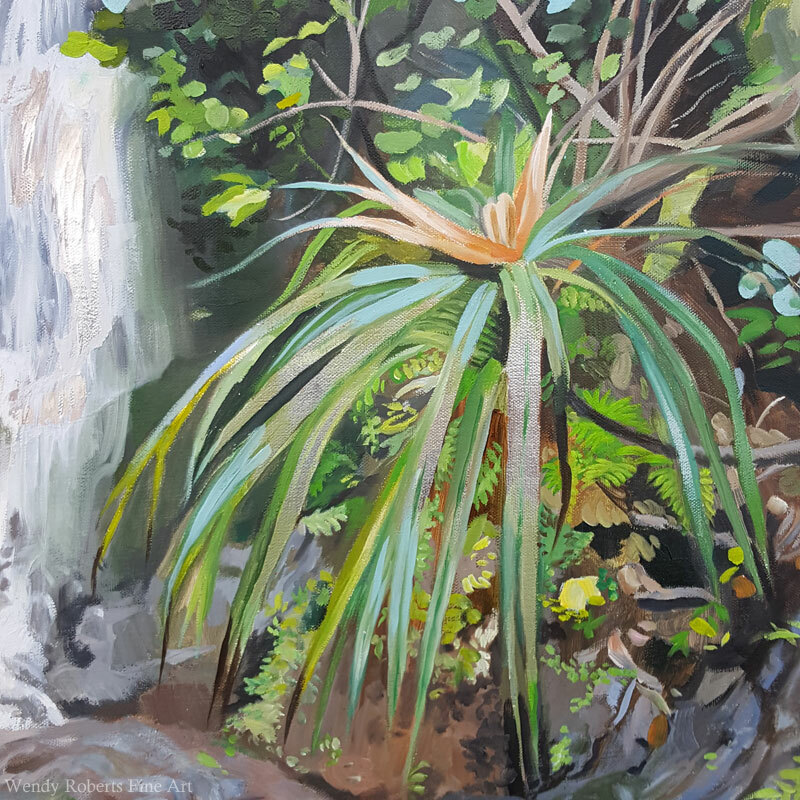 The Wahi Pana: A Sense of Place exhibit will consist of a historical education session for all artists on a selected location (the are 1 – 3 locations per Hawaiian Island). Over the weekend of March 8 – 10, artists will be meeting in a limited selection of special historical areas to create art on site. This will foster community and more richly illustrate the way different artists experience the same places. The resulting art will be curated to assure quality with a desire to show the diversity of work created by artists living and working in the islands now. Dawn’s underlying question is whether knowing the history and lore of a specific location will enrich or change the appearance or focus of art done on site where artists can feel the energy of the area and remember the stories they have been told. 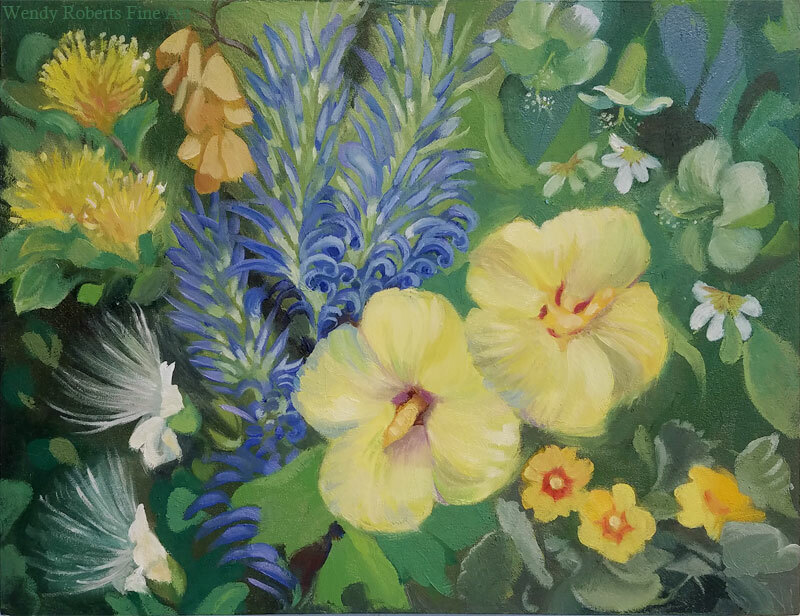 She is an ardent plein air watercolor painter, and it is inevitable root that her concept grew from. This habit of painting regularly outdoors is widespread among a variety of media (oil painter, pastel artists, etc…) especially here in Hawaii where the weather allows for painting outside year-round. The art in the exhibit will not all be paintings and drawings. Other media can be adapted to be created at least partially on-site, so hopefully we will have a variety of lovely 2D and 3D pieces with a palpable sense of place. The show will center on the feeling that stems from first-hand observation and familiarity with the artist’s chosen location. I suspect for many artists the educational segment really will deepen the sense of these locations being unique, and special to history. In turn, perhaps the locations will be more meaningful to the artist as well. As of this writing, on February 3, 2019, there is a website (wrangling the website will be one of my biggest contributions to the show). It is destined to grow with time into a more comprehensive and information-rich part of the exhibit. Right now, it is mostly geared toward artists, spelling out the concept and presenting the prospectus and calendar. We are trying to spread news of this opportunity throughout the islands. As time goes forth, the site will transform into an online catalog and documentation that augments the exhibit for visitors to the gallery. The address is: www.wahi-pana.com. I will certainly mention it again in the months to come, and expect to be posting a few updates on Instagram and Facebook as the events unfold. Hopefully one of my pieces will be part of the exhibit as well. This song is the inspiration for this painting and has always been a favorite of mine. My Dad listened to the Moody Blues a lot, so these songs shake loose childhood memories for me. I was missing my Dad when I came up with the idea for this painting and I wanted to spend some time with music that reminds me of him. This song makes me feel grateful for him. He gave me so many precious gifts – his time, his patient listening, sound advice, and love. I chose a series of photos from the ridge of a mountain that I took on a hike a couple of years ago as my starting point. The colors in photos like that are never right – it’s a ghost of what it really looked like. That’s the amazing thing about a painting. You can adjust the painting so that the colors are more like the human eye perceives them. 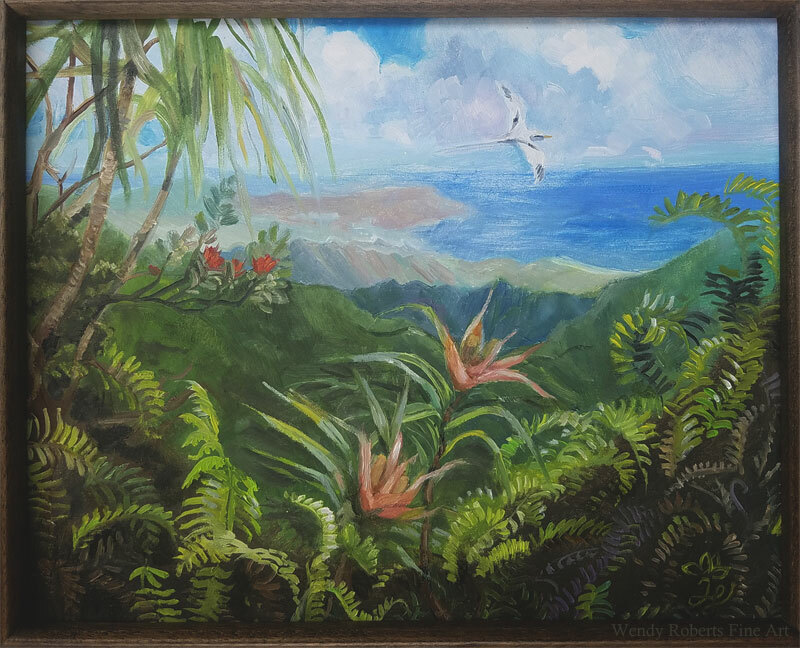 I wanted to capture the feeling of standing on the mountain looking out toward the ocean, surrounded by beautiful rare plants and birds. When I hear this song, it evokes a feeling similar to the way I feel on the summit of a mountain. To be in the upper elevations of the mountains is to gain a physical perspective that tends to inspire inner perspective. I wanted to work these emotions into my painting. The soaring bird in the distance is a tropic bird, and when I watch them glide, it fills me with the same mix of emotions as this song. When I first saw white-tailed tropic birds, they looked mythical with their long white tails almost glowing in the sun. They fly with effortless grace, using the updrafts of the mountain to lift high into the air. Is it possible to watch them without daydreaming about what that would be like to travel on the wind? Dad always used to say that one of his biggest wishes was that we could go together on hikes in the mountains he loved, but he was quadriplegic, and he couldn’t hike on little paths on the steep mountainsides. Instead we would go on drives with his wonderful little electric wheelchair-type vehicle into the less developed roads of the time, up to the mouth of the canyon. He showed me how to stay still and watch for animals like otters and muskrats at the edge of the rivers. We used to watch squirrels and birds together and pick wild plums. We could not drive very far with the battery power he had on the chair at that time, but it was amazing the things he could find in such a small radius. Now I wish we could go on hikes in the mountains of Hawaii together. I want to show him the plants, flowers, birds and waterfalls. I want him to be able to see this view in person that I have painted because I know he would appreciate it fully. He used to tell me about the caves and rocks he found during hikes when he was young and I would wish so much to find them, but of course it is impossible to give directions in the days before GPS in wild mountain range. His stories revealed to me that the mountains are magical. Anything could be hidden in the valleys and boulders. He taught me that the mountain was a place of beautiful secrets. I was given the freedom to hike deep into the mountains, even though he wasn’t able to go with me. As long as I told my parents which part of the range I was going to hike, I could walk up the street and onto the trails of the mountains within minutes. He understood my need to wander, to find my own amazing places. I found many beautiful sites; the hillside with multicolored dragonflies, the patches of wildflowers, a small waterfall, a particularly secluded bend in the river where I loved to sit and think, the craggy little cave that always contained interesting animal bones, the valley where the deer would gather in huge herds and I could peek over the rise to see them without them noticing me. It all seems like a fairy tale now, but it remains a cornerstone of my deepest self. Now I find new treasures in a new climate; the largest breadfruit tree I’ve ever seen growing in the wild with branches that look like mature trees, the most lovely ridge view where the water is many shades of vivid blue, the best places to see certain kinds of birds, places where there are tiny frogs that fill the air with beautiful sounds, groves of ginger that have naturalized and grown tall as a forest, thickets where I can pick and eat wild guavas until I am full, a tiny stream with wild Hawaiian raspberries and a nearby spring, huge bird’s nest ferns as big as a person, and lava tubes covered with vines. There are scenes worthy of a painting on every hike! If a hike has a summit, like this one did, I look out over the land below, and I still feel the same way I did as a teenager. I am filled with a sense curiosity about the future, I think with gratitude about the past, and I am in a place of perfect contentment at the present, looking out over the miles below. It is a timeless state of mind, fleeting yet infinite. 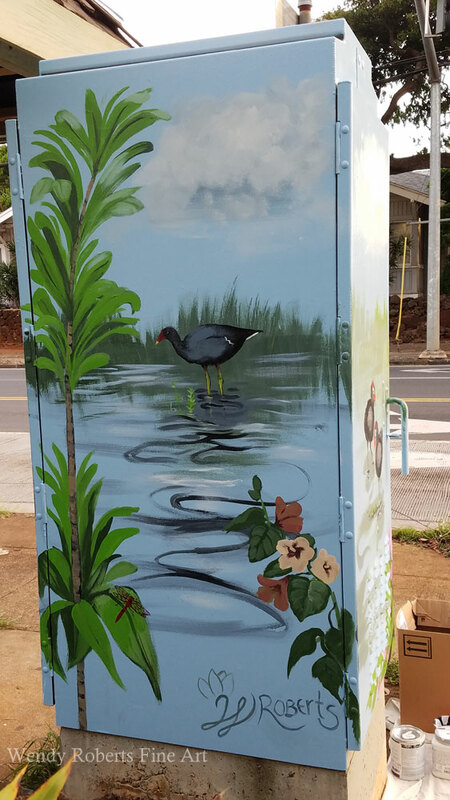 On Saturday 22 and 23, a group of artists volunteered to beautify the traffic boxes in Kaimuki. 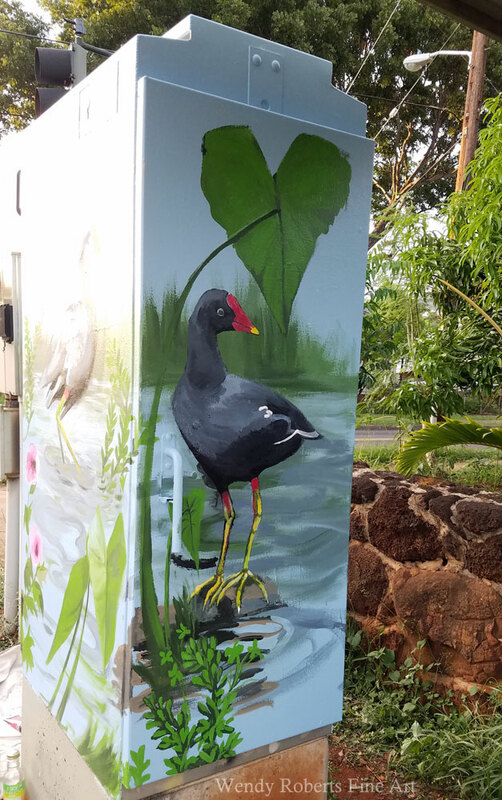 Though I was only able to participate for one day, I was able to finish a very large (6′ X 10′ in all) traffic box mural on the corner of Waialae Ave and 16th Street – right next to a bus stop. It was a great experience and the neighborhood was very supportive and appreciative! The design process began with a sketch a couple of weeks prior. 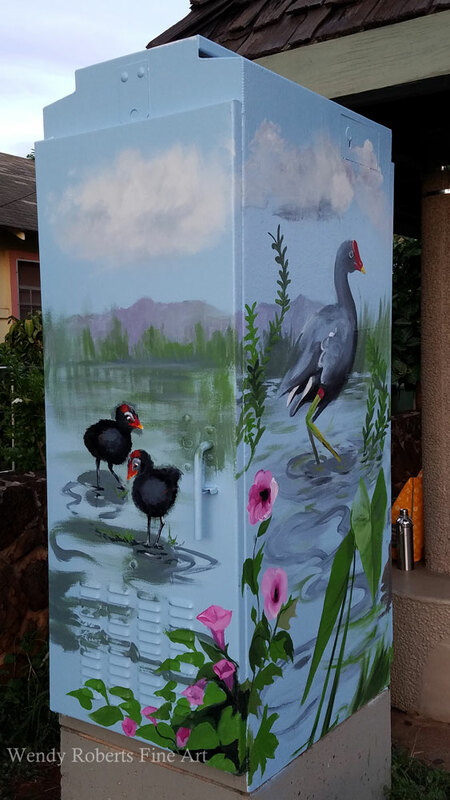 It’s rough, but you can see I stuck fairly close to the plan, just adding a few more native and Polynesian-introduced plants when I found out that the extremely nice family living close to the box would know and enjoy having more plants on the traffic box. 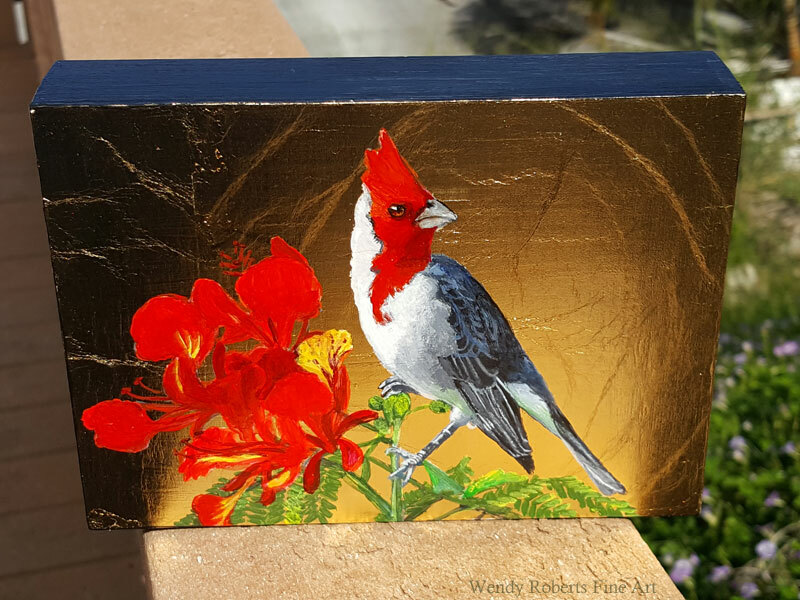 It turned out the neighbor adjacent was an avid gardener and bird aficionado, and they will be looking at this box all the time, so I wanted to make a special adjustment as a thank you to them for their unusually kind hospitality. They even brewed me a cup of tea using leaves from their own garden! If you look at the box in person, make sure to peek at the back. I painted all the sides – the back was just as important as the front. The back is inspired by the name of this neighborhood – Kaimuki. Ka imu ki means “ti plant oven”. It was an area famous for the many ti plant ovens on its hills. The ti plant was a very important and useful plant to the Hawaiians. It is still in heavy use today as the raw material for hula skirts, lei, and also as a leaf that can be used to cook. Hau, a plant used for medicine and for fiber for tough ropes is also on the back. I painted a lot of taro on the front and sides which is a Hawaiian staple food that is often growing wild in wetland areas. 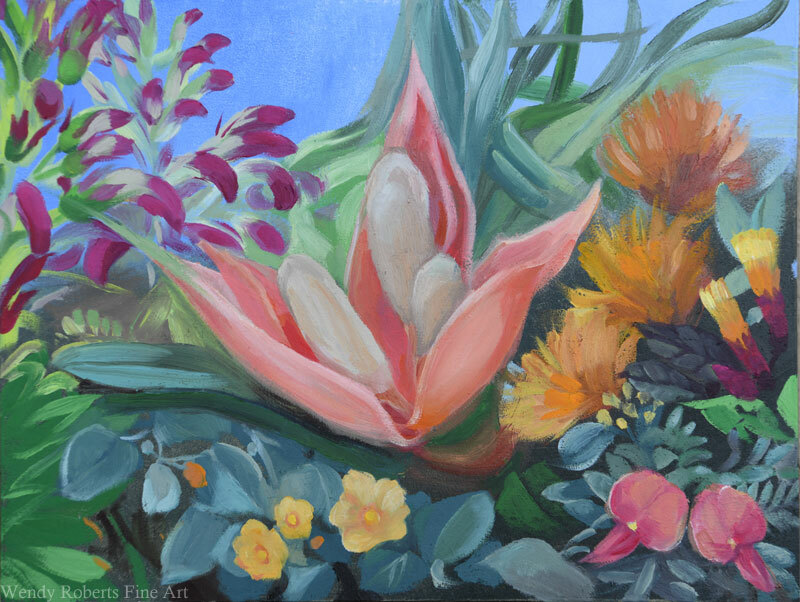 Finally, I painted pickleweed, pohuehue, a small fern that looks like a 4-leaf clover, and a wild pink hibiscus, all plants that preceded human settlement. The finished piece was accomplished after a very touching Hawaiian blessing. I felt the power of the ceremony followed me throughout the day, inspiring an unusually productive painting pace. I skipped lunch to race the sun, moving around the box as the shade moved. I enjoyed talking to various visitors throughout the work day, especially meeting a lot of the neighbors. This area really has strong community feeling. Despite the major road, the neighbors know and care about one another. Many have lived there a long time. I was treated exceedingly kindly all day long – countless shakas, “mahalos!”, and nice comments from passing cars, and neighbors offering juice or chocolate milk, etc… I cannot thank the community of Kaimuki enough for the aloha spirit they showed during this process. It was very heart warming and made me really want to do this project justice! I am very grateful to Jennifer Noel (the organizer), Bill Brizee, and Tracy Brilhante for getting me involved with this project and helping to make it all work. Thank you to the Kaimuki neighbors who were so supportive and grateful for the project. They made all the artists feel like a million dollars! Thank you to the following photographers who kindly posted photos of native birds and flowers online in creative commons like Flickr Commons and Wikimedia Commons to allow for accurate reference photos for this project: Dan Clark, David Eickhoff, Forest and Kim Starr, John and Karen Hollingsworth, and Rick Obst. 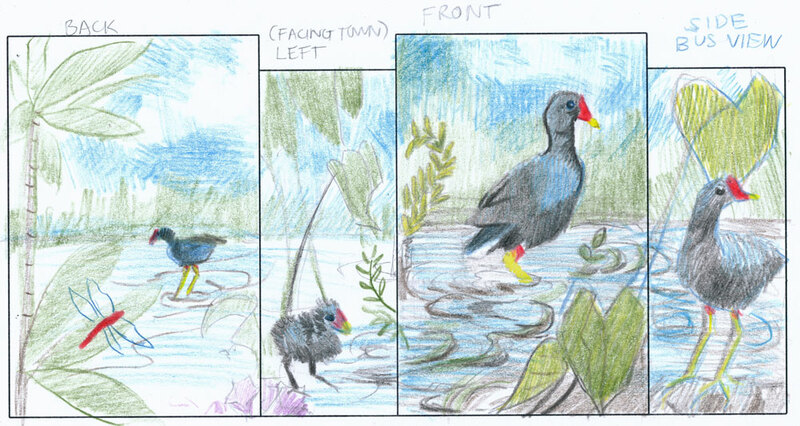 Without the lovely photos I could not have made the various Hawaiian Moorhens and plants as believable. Mahalo nui loa to all. 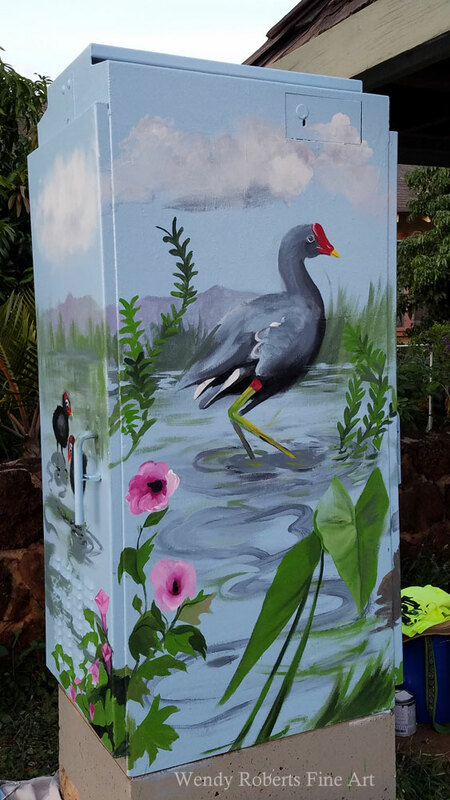 I hope the traffic box will brighten the area and be something the neighbors enjoy seeing. Yes, Gessobord is spelled strangely to protect copyright. I always feel like a kindergarten kid typing it out, but I swear it is the company’s trademarked name, not my poor spelling skills. I wrote to my email subscribers that this would likely be the completed eye, but the very next day I proceeded to paint another coat and covered some of it to blend it in with the new flesh surrounding it and now I am even happier with the way the face is shaping up – It goes to show I never know which pieces will actually be retained because a painting is a sensitive balance of relationships between the various pieces. This is still kind of fun to share as an in-progress tidbit. The landscape I will wait to show until it is done. It shouldn’t be too long of a wait at this point. 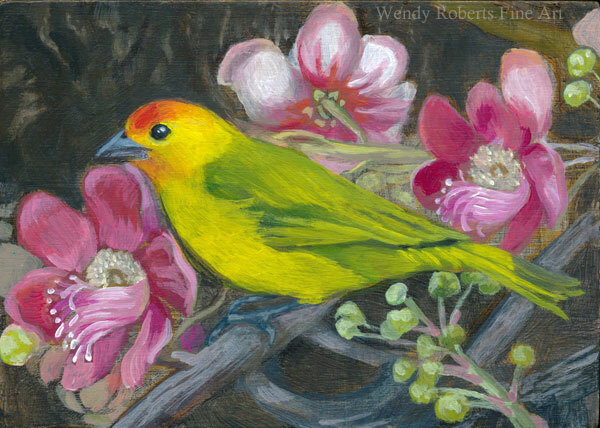 I hope to unveil it at my upcoming solo show at Kalapawai Cafe in Kailua in October. I found this little paragraph in my drafts from 2015 and thought it was a good tidbit of “thought-history” to share. I have since acted on this idea and learned to use metal leaf. What I had in mind was an array of results. I’m going to do the exact opposite of what I probably should do and reverse the countdown to share my favorite one first. This realistic landscape, Sacred Space, with just a touch of subtle leafing in the water and leaves (my favorite use of leafing to date) really catches the eye with movement as it shifts and reflects the lighting. At night it softly reflects any lights in the vicinity, remaining interesting to look at when other paintings have ceased to be visible. 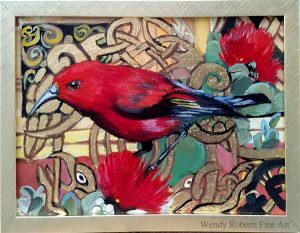 The whimsical metal leafing celtic-type manuscript bird painting below with an apapane and ohia woven into the image is probably the closest to the source of what inspired me to start using metal leaf. The Secret of Kells – a gorgeous animation featuring the beautiful illuminated manuscripts of Kells was the spark for me that led to learning how to leaf. The story within the animation is fictional, and full of fairy folk and charm, but the book is real and so is the heart of the message within the movie. It’s gentle in spirit and stunningly beautiful! I highly recommend it. This animation made me think of the beauty of the illuminated manuscripts, and I began to wonder what monks from Ireland would have painted they would have seen Hawaii. This is a visual combination between the Celtic style and realism. 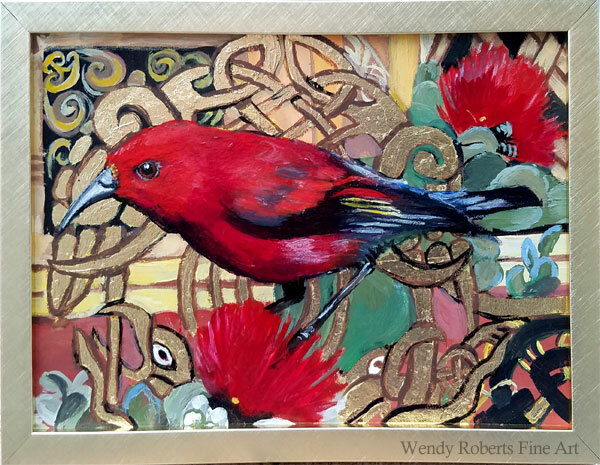 The monks would have translated the bird and the ohia into their imaginative style, but I wanted to have a play between the two worlds. Busy and intricate celtic knotwork featuring birds is leafed on top of adaptations from a page from a celtic manuscript that weaves around the realistically painted apapane and ohia that intertwines decoratively with the realistic bird and flower. 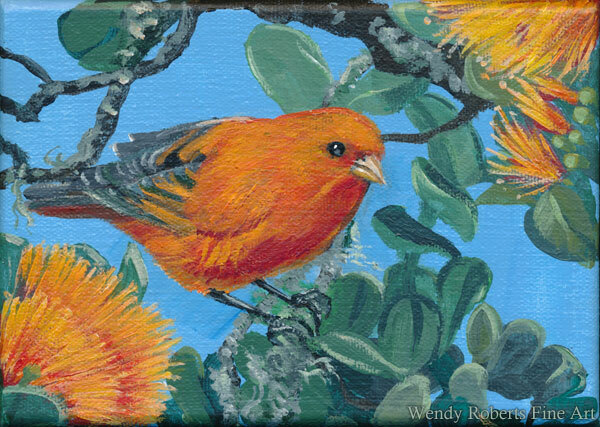 This endangered bird and the iconic flower of Hawaii that provides its habitat, are more rare than jewels (and just as colorful). Here they are treated like precious treasures – illuminated like the most important words of an ancient world. 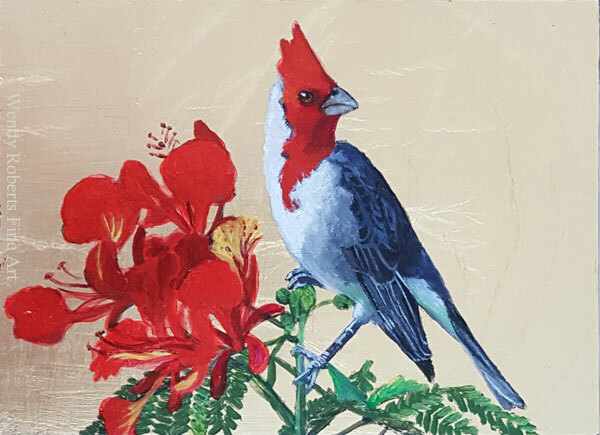 Sometimes it’s nice to paint a bird in front of a simple background of metal leaf like this copper/zinc leafing surrounding the red crested cardinal. The leafing is allowed to show off the interesting ripples that run through this particular type of leaf. Here I have shown the piece in two drastically different lighting schemes. I love the life that metal gives to the piece – constantly affected by the surroundings. Sometimes it is hard to do it justice in a photo. I am continuing to explore the realm of metal leafing both in oil and in water-based works. With different sizing and sealants, I can work with metal in either media. It is very exciting to see what it can add to artistic creativity. It can go under or over paint, and multiple metals can be used in the same piece. It produces a piece that cannot be replicated by a camera, which is a major bonus in my opinion, I love the light and movement it imbues into artwork. I use it judiciously in some but not all of my pieces. There is a type of weather that happens right before a small summer squall that is fleeting but beautiful. The sun glistens on low, choppy waves that glitter like sequins under a spotlight. Offshore islands fall into dark purple shadow. This contrast makes the ocean look particularly surreal. It emphasizes the green tones in the waves and creates a creamy turquoise color as the waters are churned with oxygen. This will be a short refreshing storm that will make the hot sand smell damp. It will finish in a sun shower as rain and sun combine in diamond drops on every leaf. Perhaps there will be a rainbow arcing across the sky. The forecast is in front of your eyes if you know the beach well. How many summer squalls have these trees seen? How many waves have they heard rushing ashore? When I see weathered trees along a coastline, I think of them as sentinels – guards for the approaching wind, waves, and storms from the sea. The boughs of these trees at Kalama beach are sculpted by wind, the flow of air made solid. Their roots are protecting the shore, holding on to grains of sand although it seems an impossible task. It is a marvel to me that anything can grow in the sand and the heat of the beach. Despite the sparse nutrients and the blazing afternoon sun, they provide shade and protect against wind and erosion. 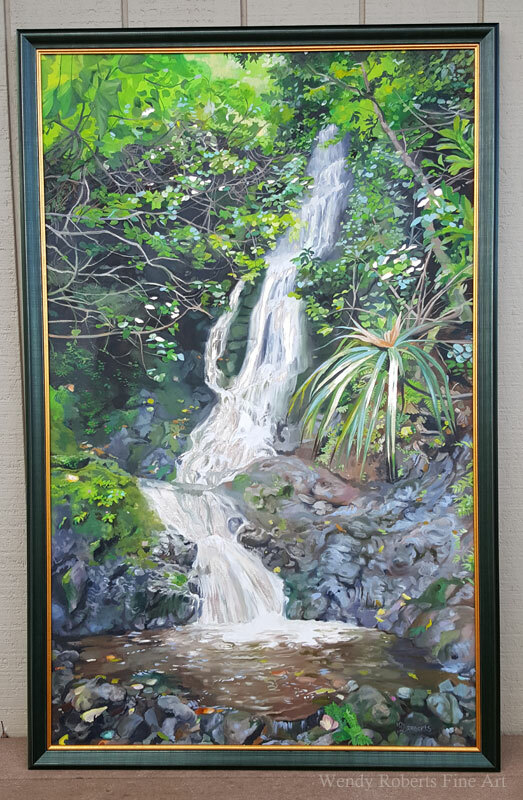 This oil panting will be at the elegant and refreshing Lion Coffee Cafe (1555 Kalani St, Honolulu, HI 96817) which has been newly remodeled. If you are on Oahu, you can have a cup of coffee and a cookie or pastry and enjoy the show anytime Monday – Saturday from 6 AM to 5 PM between now and June 30, 2018. Today I have finished a painting that I shared the early phases of on my Instagram account. 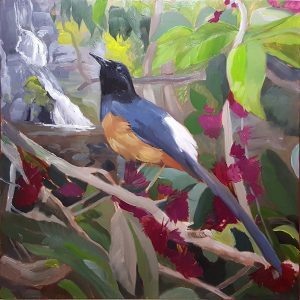 I completed “Shama Thrush in a Mountain Apple Tree”, a piece meant to share the best aspects of one of my favorite hikes deep in the shade and protection of the lush Ko’olau Mountains. 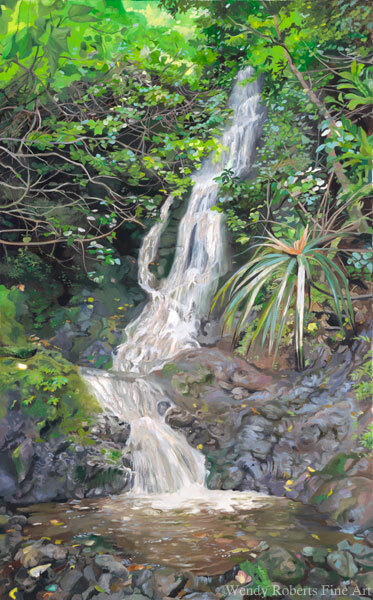 In the background, you can see the same waterfall I featured in my prior piece, Sacred Space. I love this waterfall because the rocks have a lot of character. 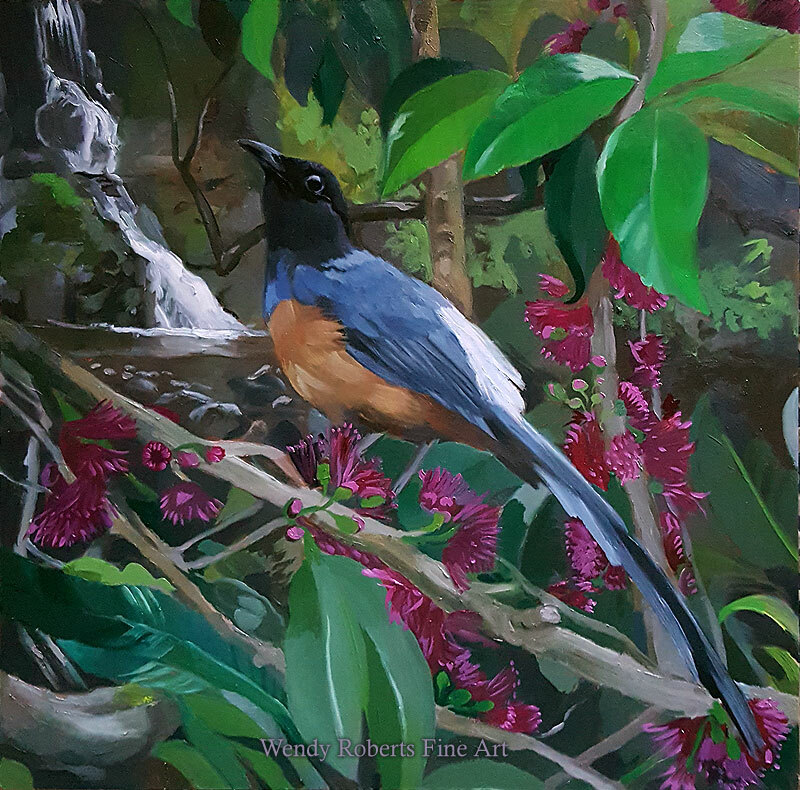 This time, the falls are not the star of the piece, but take a supporting role as the very real location where many white-rumped shama thrush live. The shama thrush, its flowing tail a visual echo of the waterfall, perches in the branches of the mountain apple tree. Here I have recreated the magical experience of finding the bright pink flowers of the mountain apple in full bloom. If I could show it all in the same painting, I would depict how the petals carpet the ground with a layer of vivid pink, and I would paint the smell of the cool moss and the sound of the water. Shama are very curious birds and will often follow you, gliding from branch to branch for a long time as you hike, watching and listening to you as you walk through the trees. As highly intelligent birds, they are not only keen observers, but also mimic birds to a limited extent, capable of learning short calls if you whistle to them repetitively. If you are lucky, they will whistle the song back, quickly evolving your small tune into their own variation (4 or 5 notes is a good maximum if you are trying to teach them). They may add clicks, chatters, trills, and melodic chirps until it blends seamlessly into their own repertoire. Their voice is one of the sweetest of the island, with a clarity I would compare to the Meadow Larks of my childhood. Some of my most unusual experiences with wild birds have been with shama thrushes. If you are quiet and still, they will venture extremely close, and examine you carefully with their shiny black eyes. Unlike Snow White, I haven’t managed to convince them to help me with my laundry…yet. I have been quiet. This is a sure sign that I have been working on something very large. I am happy to unveil my latest piece: “Sacred Space” measuring 30″ x 48″ and what makes it such a large project is the level of detail. 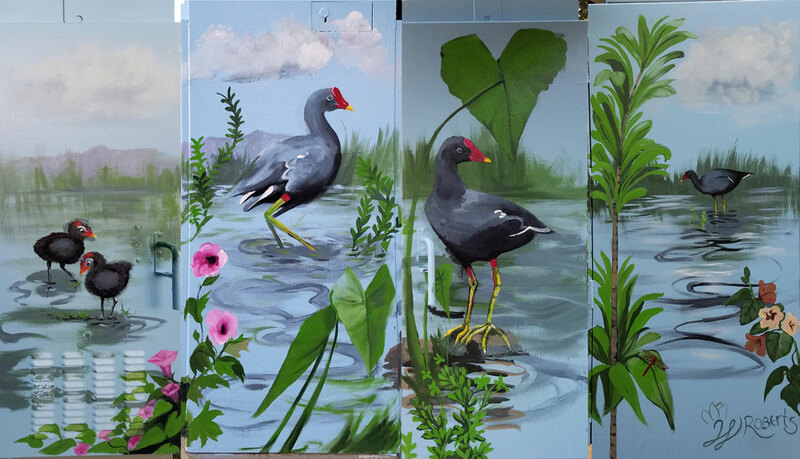 Murals are larger, but they also get painted with large brushes. The idea for this piece hit me like a bolt of lightning 4 years ago when I had just watched “Secret of Kells” for the third time. “The Secret of Kells” is a cartoon so beautiful it should be thought of as a moving piece of art rather than what you would typically think of with animation. It is about Celtic illuminated manuscripts and if you haven’t seen it, you should set aside a movie night to take a look. It is a beautiful story with amazing animation. After viewing the amazing animated manuscripts once again, I wondered what tropical illuminated manuscripts would look like, and then after a few odd sketches of extremely stylized Hawaii scenery with a Celtic knotwork spin, the thought pushed into its final form: “What if I used metal leaf like paint to add movement to the water and the leaves – the sunlight dappling, changing, shifting like the light on the leafing?” I knew this had a potential to add another element to the painting, allowing me to more fully express the sense of awe felt while secluded next to a stunning waterfall. I had to learn how to use metal leaf and get good enough to apply it smoothly. That took about 2 years. Then it took a lot of time and care to work my way through the details on the canvas. I set it aside a few times to work on other things and allow my brain time to solve some quandries by passively working on them in the background. I always returned with a fresh point of view. 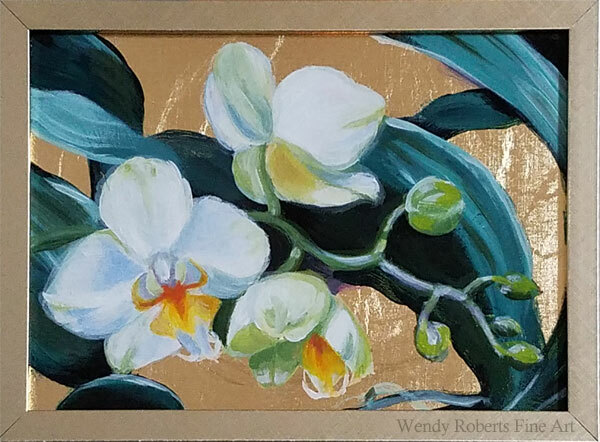 This will certainly not be the last “tropical leaf” painting! I am really interested in using the dynamic shimmer of metals in my work. I had to adjust for the variability of the silver leaf’s changing values, but the final effect adds motion and life that is impossible to show in a photo but I’ll try anyway by posting a detail from different angles. 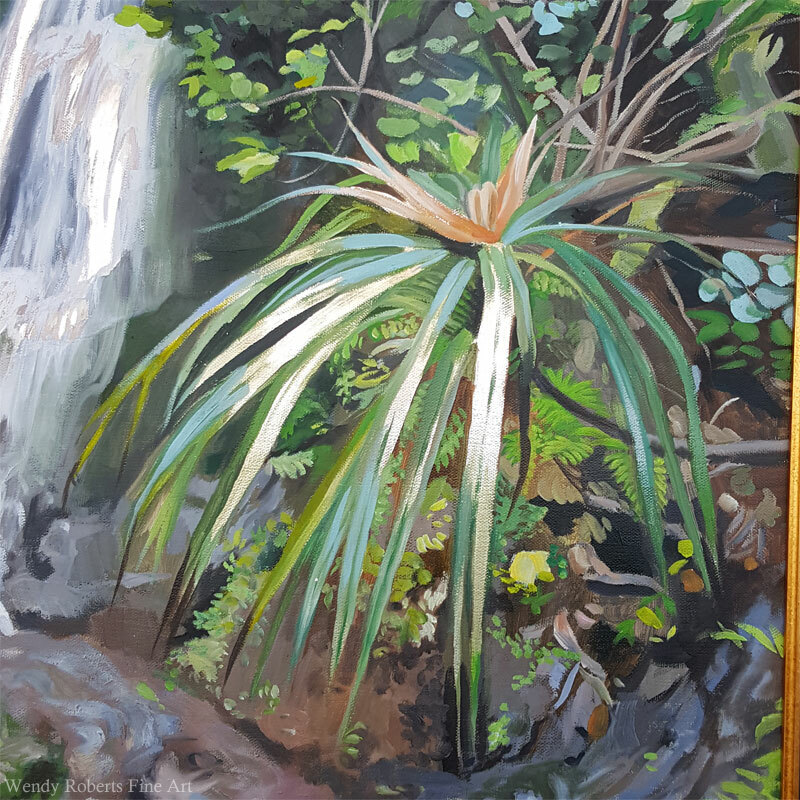 Here is the ie ie vine in the painting, a woody endemic Hawaiian flower in the pandanus family, shown from two angles so you can see how the silver picks up and reflects light dynamically. You can also see a small portion of the waterfall’s silver leaf. Giclees (durable canvas prints) of this piece will be available soon. 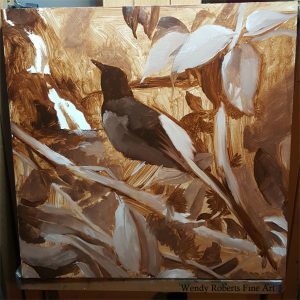 It won’t have the leafing unfortunately since it has to be painted and blended into the rest of the piece, but when I get the final scan, I will be posting it on my “Giclees Available” page. A carnival? You might find that odd. Let me explain. Hawaii has a handful of schools that function more like colleges. They are rigorous, demand excellent grades, and inspire the kids who attend to really strive for their best potential. Punahou is one of the largest of these. They have a great scholarship program so that the school can admit kids who can benefit from the challenging education at a rate of payment their family can afford. Every year, Punahou holds a carnival to bridge the gap between what the kids are able to pay and what the school demands to keep the facilities top notch. Oddly enough, they have developed one of the largest, most prestigious art shows in the islands. I am pleased to be participating. If these pieces are sold at the carnival, half the proceeds will go to the Punahou scholarship fund. 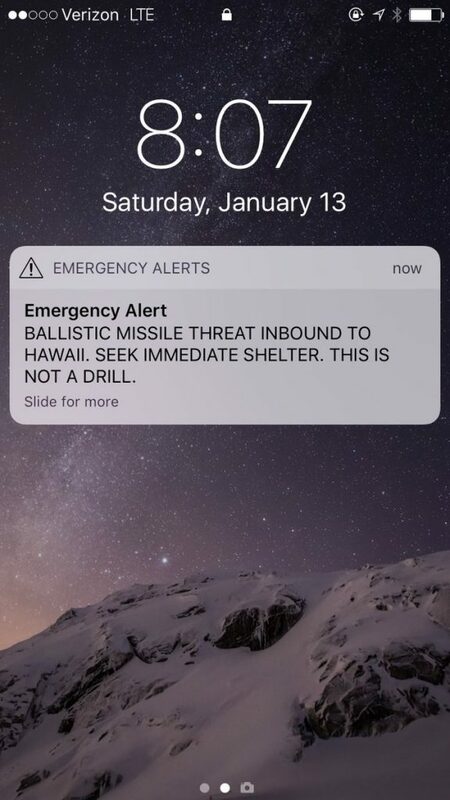 You probably heard the news about our false ballistic missile warning here in Hawaii. There was a lot of panic, but also a lot of cool heads too. You don’t hear about the cool heads on the news. It’s not very exciting compared to reporting about the very real panic a lot of people felt, but most of the people I know were concerned rather than panicked. Nonetheless, for those of us in the “concerned” category, it was still a very strange morning. Like a dope, I got up out of bed and went to look at the sky because I am not a good morning person and it took about 20 seconds for me to realize that of course I wasn’t going to see the missiles – they take 15 minutes to arrive. All I could think of was “bzzzzzzz” (the brain equivalent of TV static) and then after another minute of squinting into the sky and trying to be sentient, I thought “How do I prepare for this? Hmmm….” I realized you can’t prepare for something like that past what you would do for a hurricane, and I was already passable with my emergency kit, so no need to worry about that aspect. I remember being relieved and a bit embarrassed that I couldn’t think of any unfinished business or last desperate wishes that could be fulfilled in 15 minutes other than filling the bathtub with water. It made me feel uncreative. Some people have the wackiest ideas of what to do with their last few moments of life, but I, who make my living being creative, drew a blank. I also thought it was weird that North Korea would actually send a missile. I know they are always threatening, but they have lots of reasons NOT to actually go through with it – in fact it’s highly unlikely if you sift through the pros and cons. Then I realized no sirens were blaring. “Let’s check it out on Twitter to see if it’s false!” The lack of sirens was fishy. If there is one thing I have learned from being a night owl, it is that if you have a weird earthquake at 3 am, Twitter is the best place to figure out if other people know what is happening. I don’t know what kind of magical server is running over there, but the second something bizarre happens, you can start searching for information, and usually you will have your answer in under 5 minutes from a reliable source – technology is wonderful! I ran to Twitter to figure out what was going on with this alarm, and immediately got the word it was false from our local hero of the day, Tulsi Gabbard, who immediately confirmed the status of the alarm and sent out a very quick Tweet. Many of us had moments after it was all over where we realized our lives were the everyday humdrum and we were so grateful! It’s NICE to be stuck in traffic (sort of). It’s nice to fold laundry and have a list of errands. It is a luxury to have routine everyday life unfolding. It is nice to know you have kissed your kids and given your family notification on a regular basis that you love them. I felt squared away and spared and happy to be sweeping the floor. And I am also grateful to be able to take all the everyday stuff for granted too. It’s nice to be able to relax into it rather than having to be acutely aware of all the beauty and all the multitudes of blessings we have in our lives every moment of the day. I am grateful for the ability to take it all for granted. That’s part of the charm of the “everyday” too. 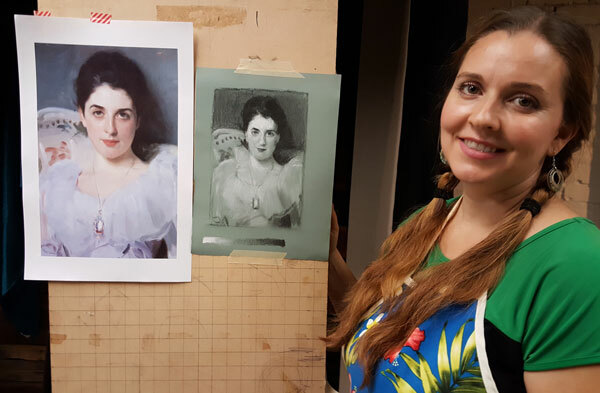 This October an November I have been honing my skills, I took an amazing workshop at Zwick Academy of Fine Art (ZAFA) entitled “Master Copy Workshop”. 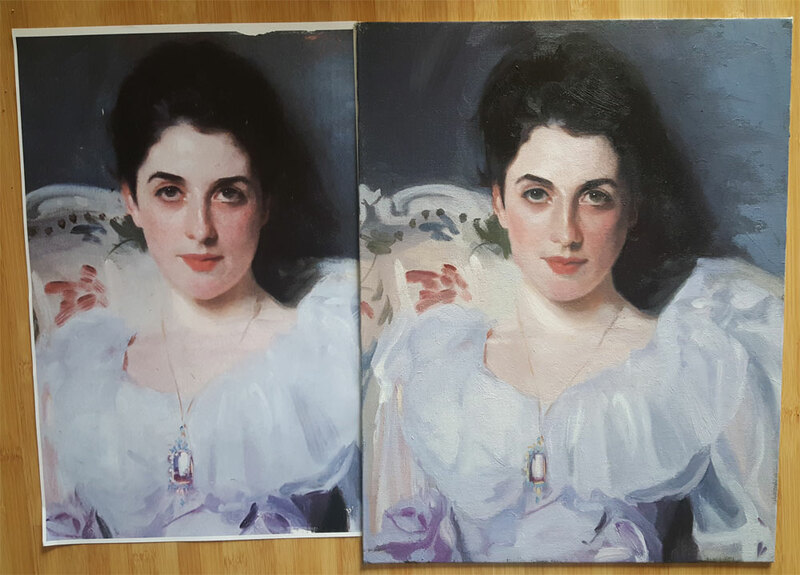 We worked on a master painting copy of a work by John Singer Sargent – I chose “Lady Agnew” I am mostly done copying the detail, and ready to show the results. First we worked on the value study. This turned out to be quite enlightening for understanding the overall tones of the piece. It was years since I had worked with charcoal, and I found out I really love it for a drawing medium. 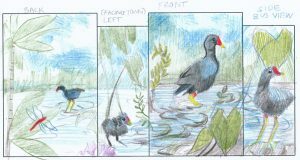 Then we worked on color studies (not pictured), before launching into the real deal. We used a nice color print out in lieu of being able to spend a month in front of the actual paintings. Every time I mixed a skin tone, I found myself saying “Needs more purple!” Sargent is a surprisingly saturated colorist. 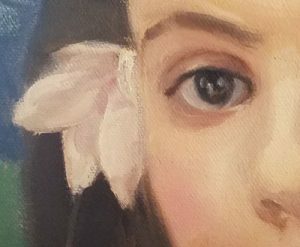 I look forward to the changes this will bring to future pieces as I incorporate the lessons learned by studying Sargent’s careful yet expressive painting style which I would classify as “effort-filled effortlessness”. I can highly recommend William Zwick’s classes. He’s an excellent teacher! I learned more in less time by doing this master copy under his mentorship than I would have if I had picked up a brush and done it without guidance. Maybe I will end up doing more copies in the future, and I would even dare to do them solo now, but I think the process of being guided through this copy helps me know how I would go about it in the future if left to my own devices. It takes a lot of research if you plan to replicate the painting down to the technique and palette. I was grateful to have that footwork in place already for this piece. There is a little glare on the photo, but I think it is not hampering the viewing of my copy too much. Also, the piece is not varnished yet. I will post again when I have the necklace done and the varnish done (which will deepen the colors), but you can see that the detail is almost complete. I am planning to frame this and hang it in my studio to remind me how to soften my edges. What a great way to spend October of 2017! 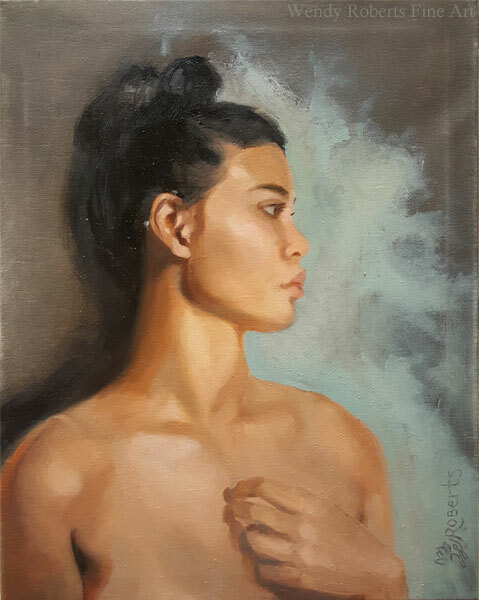 I returned to ZAFA in November to work on my master copy-earned skills with some life painting sessions, and painted a portrait of the absolutely gorgeous model posing at ZAFA for the week. Here she is with her painting. Posing for hours like that is not easy. She did a great job of standing still for the 9 hours (!) it took us all to paint her likeness. I worked hard to soften the edges and was pleased with the results, as was the model who bought the piece – I always love it when a painting finds its home. 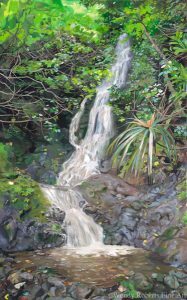 ZAFA is one of the few places you can go on Oahu for a multi-session life painting experience, which I highly recommend if you are looking to hone skills and learn to paint beyond the confines of a a photo. As of 2017, it is on Fridays and you can sign up with ZAFA to get notice of the status of the sessions. We are lucky to have high quality art resources like this close at hand. Maybe I will see you there, fellow Oahu artists!